A comedy night fundraiser featuring international headliner Tracey MacDonald, who exploded onto the comedy scene after winning CBS’s “Star Search”. Tracey has left audiences in fits of uncontrollable laughter across Canada and the United States. She has her own Special on Comedy Now and Just for Laughs and was recently named MacLean’s Magazine Top Thirty Under 30. Please join Be the Choice, Tracey MacDonald, MC Ron Sparks, and other cutting-edge local talents for a night to remember! All proceeds will support Be the Choice. What is Be the Choice? 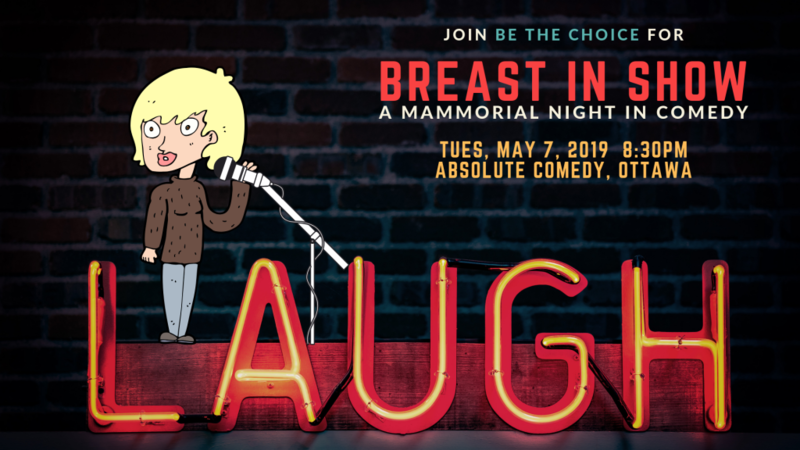 Be the Choice is a not-for-profit organization that is changing the way breast cancer diagnoses are experienced and treatment options are understood. Be the Choice has developed a tool that helps breast cancer patients make more informed decisions about their treatment options. The “Decision Tree” sheds light on breast cancer treatment options and shows the connections between those decisions. It also helps other breast cancer patients understand and explore their healthcare choices. Why should I give to Be the Choice? We realize that donating money is an important decision and should be weighed carefully. In the world of charities, we are unique as we have a singular focus which is to deliver the tool. We also have dynamic, efficient, and effective volunteer leadership, unpaid medical experts, and minimal overhead expenses. The money you give will go directly to building the decision tree and will support the designers and software engineers working on the tool.